The Sacred Jaya Siri Maha Bodhi in Anuradhapura is reckoned as the oldest surviving historical tree in the world. It was brought to Sri Lanka by the Theri Sangamitta, daughter of Emperor Asoka and was planted in the Mahameghavana Park in Anuradhapura in 249 BC by King Devanampiyatissa. It is said to be the southern branch of the Jaya Siri Maha Bodhi at Buddha Gaya in India under which Lord Buddha attained Enlightenment. The Mahavamsa or the great chronicle of the Sinhalese provides an elaborate account of the establishment of the Jaya Siri Maha Bodhi in the Island. Bodhi means wisdom that understands the four Noble Truths. Thus the tree which assisted Lord Buddha to achieve wisdom or enlightenment is called Bodhi. Historical and literary records indicate that King Devanampiyatissa sent his nephew Arittha on the important mission of bringing Theri Sangamitta to Sri Lanka to establish the Bhikkuni Sasana and along with her the Maha Bodhi Sapling. The Mahavamsa (5th century AC), the Samanthapasadika (5 century AC) and the Maha Bodhivamsa (12th century AC) describe the miracles that are said to have occurred at the time the Maha Bodhi Sapling was obtained from the parent Bodhi Tree, conveyed ceremonially and established at Anuradhapura amidst great pomp and pageantry. The dispatching of the Maha Bodhi to Sri Lanka had been associated with great celebrations. Emperor Asoka himself had been present at the Port of Tamalitta when the ship carrying the Maha Bodhi Sapling left the shores of India. The Maha Bodhi was welcomed with great honour and respect at the Port of Jambukolapattana in Sri Lanka. King Devanampiyatissa himself was present at the port to receive the Maha Bodhi. According to the Mahavamsa Emperor Asoka at the Port said, "I have honoured the Maha Bodhi by bestowing my kingdom thrice to the Bodhi; let my friend King Devanampiyatissa too honour the Bodhi by bestowing his kingdom." The road from Anuradhapura to the Port of Jambukolapattana had been gaily decorated. Different classes of artisans who were required to perform various services for the Maha Bodhi also accompanied the Sapling. After the establishment of the Jaya Siri Maha Bodhi it was accorded the veneration similar to the living Buddha because there was a belief that it was directly connected to kingship. The ancient chronicles have recorded various steps taken by many kings for the protection of the Maha Bodhi and its precincts. Also the royalty considered it their duty to attend to improvement and restoration work as and when necessary. In the subsequent centuries, around the high terrace on which the sapling of the Maha Bodhi was planted a Bodhigara and an architectural structure with railings had been constructed. Also an outer wall enclosing the complex with 4 entrances at 4 cardinal points was developed. King Dutugemunu (161-137 BC) is said to have performed an unprecedented offering to the Maha Bodhi at a cost of 100,000 gold coins. According to the Mahavamsa King Vijayabahu the 1st (1070-1111 AC) who defeated the Cholas and unified the whole country renovated the Bodhigara at Anuradhapura. King Parakramabahu the great renovated the Vatadage of the Maha Bodhi complex. Even though King Mahasena (272 to 301 AC) razed the Maha Vihara to the ground apparently no damage was done to the Maha Bodhi. The Maha Bodhi was saved inspite of doctrinal differences between the Mahavihara and the Abhayagirivihara because it was a common object of worship for both sects. In fact King Mahasena not only protected the Maha Bodhi but had taken steps to develop the Maha Bodhi shrine. Around the middle of the 13th century with the collapse of the Rajarata civilization as a consequence of a series of South Indian invasions, sacred places in Anuradhapura were encroached by the jungle. Nevertheless, Anuradhapura was not completely depopulated. While the majority migrated towards the wet zone some courageous Sinhalese continued to live in isolated pockets around small village tanks battling against malaria, drought and wild animals. Yet, they looked after the sacred places especially the Jaya Siri Maha Bodhi to the best of their ability. On the Nikini Full Moon day during the months of July or August the people of Anuradhapura came to the Jaya Siri Maha Bodhi carrying bundles of firewood on their heads to light bonfires around the Jaya Siri Maha Bodhi to keep away the wild elephants who used to enter the premises to eat tender Bo leaves. These villages carrying firewood on their heads looked like a possession hence it was called Daramiti Perahera. The Daramiti Perahera continues as an annual ritual to the Maha Bodhi even today. The custodians and the families entrusted with various duties never neglected their responsibilities nor did they abandon the Maha Bodhi. The Maha Sangha headed by the Chief Priest of the Atamasthana continued to stay in Anuradhapura to look after the Maha Bodhi and to conduct the age old rituals associated with it. It is amazing that inspite of the fact that Anuradhapura was invaded, plundered, destroyed and occupied for a considerable period of time by South Indian invaders no harm was done to the Maha Bodhi while heavy damage was caused to other edifices. Even today, 4 annual rituals are performed in honour of the Jaya Siri Maha Bodhi. The Aluth Sahalmangallaya is performed on Duruthu Full Moon Poya day in December or January when the first portion of the new harvest is offered to the Maha Bodhi. The Nanumuramangallaya is performed prior to Wesak Full Moon Poya Day in May wherein the Maha Bodhi is decorated with ornaments and milk rice is offered not only to the Maha Bodhi but to the Atamasthana or the 8 sacred places. A Devapuja is offered to Gods headed by Kaludevatabandara the deity supposed to protect the Sri Maha Bodhi. The Karti Mangallaya is performed in July or August during the annual pilgrim season. There are several daily rituals performed at the Jaya Siri Maha Bodhi by the special staff designated for the purpose. They start early in the morning with the cleaning of the premises. According to tradition, the official Buddhapuja is brought to the accompaniment of drums and offered to the Jaya Siri Maha Bodhi. Gilanpasa is offered in the evening. The beating of drums called teva hevisi is done 3 times a day in the morning, noon and evening. The Jaya Siri Maha Bodhi is under the care of the Director of the Peradeniya Botanical Gardens. The Sri Lanka Army has been entrusted with its security. The Jaya Siri Maha Bodhi Shrine is reventially referred to by the Buddhist devotees as Uda Maluwa. Jaya Siri Maha Bodhi is also referred to as Jaya Siri Maha Bo Hamuduruwo, Udamaluwe Bodhi Sami and Siri Maha Bodheen Vahanse. The entirety of the Maha Bodhi shrine popularly known as Uda Maluwa or the upper terrace actually consists of 5 Maluwas or terraces in ascending order from the main entrance namely; Welimaluwa, Viharamaluwa, Devalamaluwa, Udamaluwa and Ranvetamaluwa. The Welimaluwa is studded with many Bo trees which are commonly called Parivarabodhi and several shrine rooms. The largest shrine room is located in the Viharamaluwa. The Devalage dedicated to the deity Kaludevatabandara is situated in the Devatamaluwa. Next is Udamaluwa which supports the 1st Ranveta or the Golden Railing. The Ranvetamaluwa lies above the Udamaluwa which is the repository of the Jaya Siri Maha Bodhi often reverentially referred to by the Sinhala Buddhists as the Rankanda or the Golden Tree. The Jaya Siri Maha Bodhi is situated on the highest of 5 terraces 21 feet above the ground level. When Walisinghe Harischandra measured the Bodhi tree at the turn of the 19th century it was 30 feet in height and the circumference of the trunk was 8 feet 2 inches. The Jaya Siri Maha Bodhi had 3 main trunks and by the side of the Maha Bodhi there was another with a straight trunk. There are many other Bodhi trees called Parivara Bodhi on the other terraces. The Jaya Siri Maha Bodhi has survived while the ancient structure around it had perished in the course of time. Prof. Senerath Paranavithana has observed that later developments have swept away the ancient features of the Bodhi shrine and does not contain any vestige of the architecture of the pre Christian era nor those of the early centur-ies of the Christian era. The stone parapet wall round the Maha Bodhi at ground level was constructed by yen. Illupendeniya Atthadassi Thero with the permission of King Kirthi Sri Rajasinghe at the turn of the 18th century with stones collected from the neighborhood to prevent elephants entering the Maha Bodhi premises. The Jaya Siri Maha Bodhi is administered by the Chief High Priest of Atamasthana and the Atamasthana Palakasabha; the administrative body of the Atamasthana. There are special guards to look after the Jaya Siri Maha Bodhi. It is done as a servitude or Rajakariya in return for the enjoyment of the fruits of temple lands which they occupy and cultivate. 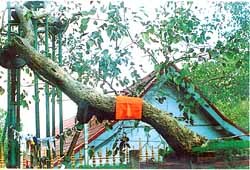 The Maha Bodhi tree was subjected to a vandalistic act by a mad man who attempted to cut it down on the 30th of July 1929. He managed to cut off a branch but the main Jaya Siri Maha Bodhi escaped miraculously. Once again on the 14th May 1985 LTTE terrorists mounted an attack on innocent devotees at the premises of Jaya Siri Maha Bodhi killing 07 inside the precincts and a further 100 outside. On this occasion too the Jaya Siri Maha Bodhi escaped unharmed. Just as much as the Sacred Tooth Relic of Lord Buddha is considered to be the symbol of sovereignty the Jaya Siri Maha Bodhi too is said to safeguard the sovereignty and the territorial integrity of Sri Lanka. The Jaya Siri Maha Bodhi has stood the test of time and has survived for more than 2250 years. It is the prayer of each and every Buddhist that the Maha Bodhi will and shall live another 2250 years at least.